Get Cara Tarbaj to personally send you his new posts. Did you know that 34% of Facebook users like a Page to get access to the brand’s promotions and/or discounts? Because of this, your Fans want you to run contests and provide offers for them on Facebook. Whether you’re just getting on the social media marketing bandwagon or are looking for some inspiration, these Facebook contest and promotion ideas will get you going in the right direction (and get you more Facebook Likes). Oh, and by the way, all of the seven examples in this article were created with Wishpond's Facebook Contest App. Facebook Sweepstakes boost your page’s engagement and collect email leads for your future marketing campaigns. This type of Facebook contest is great for first-time contest runners. These are the easiest type of contest for Fans to enter (known as a “low barrier-to-entry contest”), which means they generate Facebook Likes more easily than other types of contests. 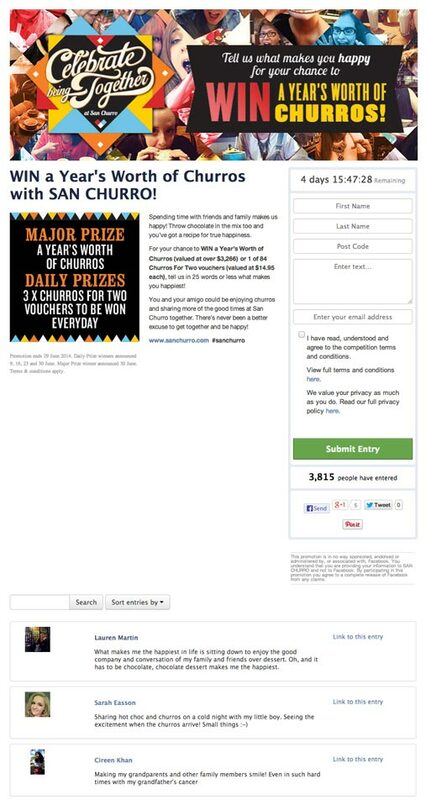 Generally Facebook Sweepstakes require minimal form fields, such as a simple email and sometimes a name. Facebook Sweepstakes are arguably the most cost effective form of lead generation, as (apart from your monthly subscription to Wishpond and the prize itself) you have literally no costs. Target your Facebook Fans with a snappy Facebook Post (or encourage people to become Fans who are interested in your business’ subject) and generate lead information from them. 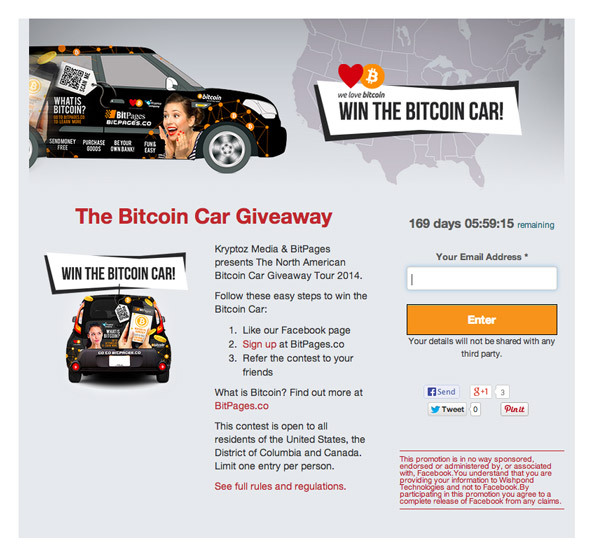 The above Facebook Sweepstakes by Kryptoz Media only requires an email, but in the description of this Facebook contest you can see that there are additional steps added. I would recommend making a Sweepstakes that doesn’t have additional steps on the side, as sweepstakes are generally regarded as very simple to enter, and not everyone may read the description. Facebook Vote Contests are great because (similar to Sweepstakes) they are simple for Fans to enter. The added benefit for you is that you can get some insight into your customer’s interests and even what they think of your products. It’s important to put a little more thought into this type of Facebook contest, as you don’t want Fans bouncing for easily avoidable reasons such as your contest being too product-oriented. Your contest must be able to relate to and intrigue your target market. Think like your consumer and how they’ll react to your vote contests. Get creative with Facebook Vote Contests and run them within your brand - asking your existing employees to vote on a new logo, merchandise, or business message. This keeps your employees engaged and gives you vital insight into what they’re thinking and feeling. Referral Promotions are great for gathering more Facebook Likes for your Page. They work by giving Fans the chance to be rewarded for getting their friends to enter. Facebook users who are not yet Fans of your page will feel that your business is credible because your current Fans are recommending it. These promotions have added potential to go viral because of this trust factor. 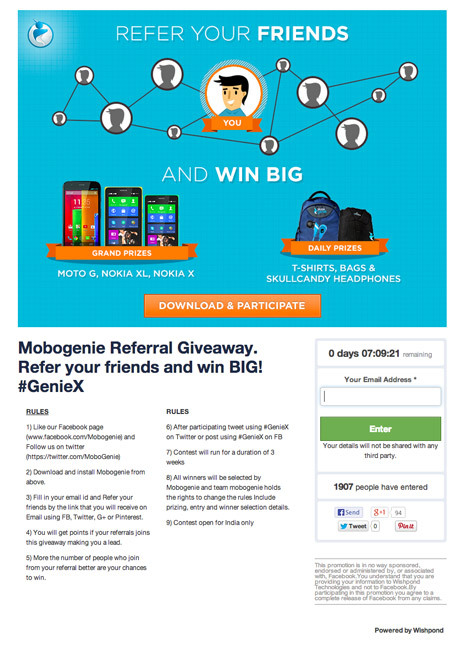 Referral Promotion Tip: Make sure your Facebook contest rules are clearly laid out in the description (like the above MoboGenie promotion), as these types of contests require more steps and can confuse entrants. Photo Contests require entrants to submit a photo in order to win a prize. 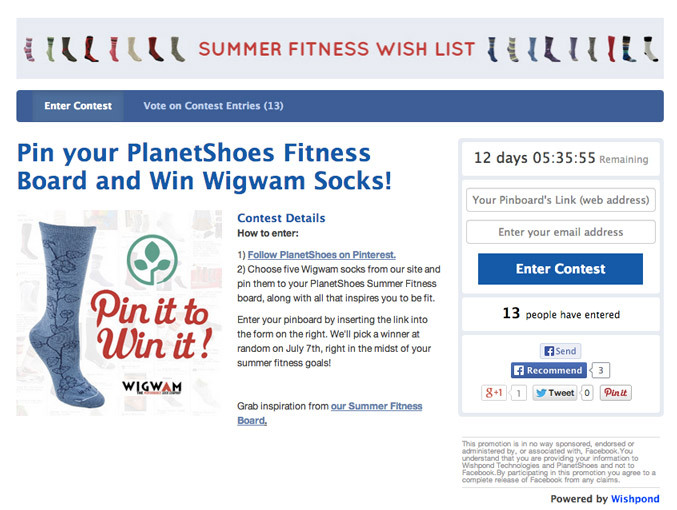 These Facebook Contests are great for gathering user-generated content for your business. User-generated content is great because you can use this as content for various social channels such as Facebook, Pinterest, Twitter and Google Plus. 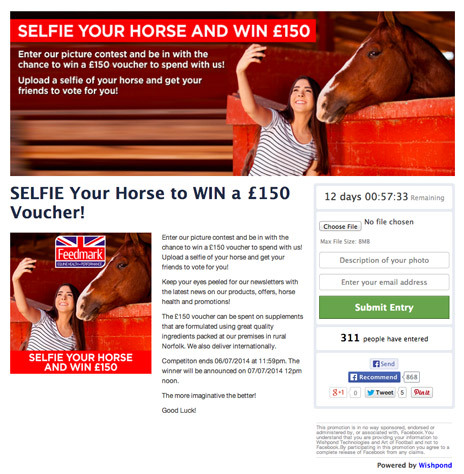 In this Facebook contest, Fans must submit a selfie of themselves with their horse in order to be entered to win the voucher. This specific Photo Contest is relevant to their business, as Feedmark is a business that sells equine health and performance products. Essay Contests require a form of text-entry in order to be entered to win (this could be an answer to a question or an explanation of some sort). 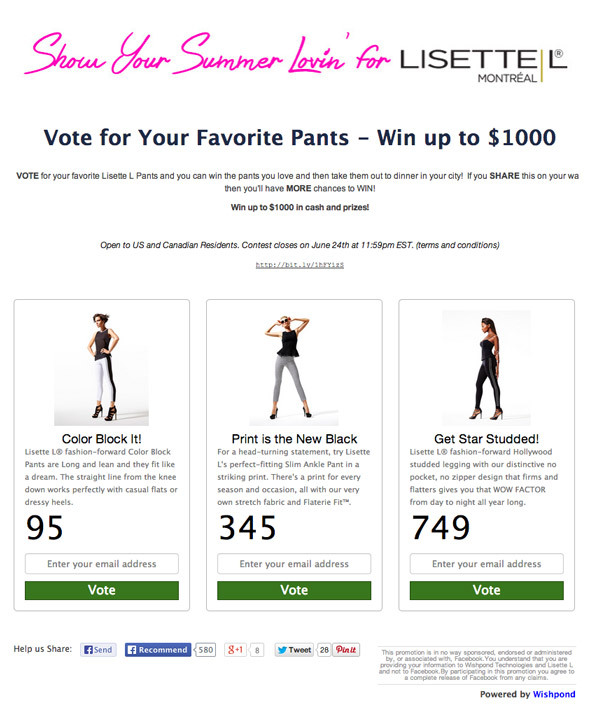 They are similar to Vote Contests in the way that they can give you insight into your customers - yet they provide you with the chance to learn way more about your consumers than a Vote Contest ever would. This type of Facebook contest gives entrants the chance to really voice their opinions about your business - or even to open up in a more personal sense. Once you have a substantial amount of engaged Facebook Fans on your page, I highly suggest brainstorming a great Essay Contest idea that’s relevant to your business to really learn more about your consumers. Pinterest Contests (also known as “Pin it to Win it” Contests) entice Fans to submit and vote on Pinterest boards. They are run off of a Facebook Tab on your Page, just like any other Facebook contest. The difference is this type of Facebook contest requires Fans to make a board on Pinterest in order to enter. They are great for driving traffic (and potentially followers) to your Pinterest page, getting repins, Facebook Fans, and more. See how you can make your Pinterest Contest successful. Facebook Coupons are a large part of the reason that you have Facebook Likes on your Page. A lot of people look for their favourite brands on Facebook to see if they have any discount offers available. Make sure to be clear about what you’re offering. The above coupon says, “1 hour massage only $25” which is very clear. This type of Facebook offer can be run for longer period of time than any other type of Facebook contest or promotion, it just depends how long you want the offer to be valid for. 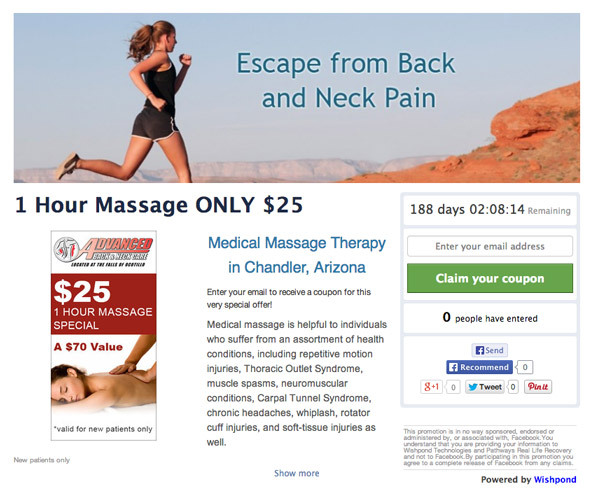 The above coupon by Advanced Back and Neck Care is running for over 6 months. If you’re going to run a coupon for this long, I suggest making the tab visible on your Facebook Page (not hidden in the drop down menu). Also remember to post about the offer once every week or two (depending on how frequently you post on Facebook). So there you have it - hopefully you have some fresh ideas in your mind about crafting your next Facebook Contest or Promotion. The process of creating your campaign is supposed to be fun, so if you have an idea you think might be awesome for a Facebook contest or promotion, run with it. Sometimes social media can surprise you - it could end up going viral. Have you ran a Facebook contest and/or promotion yet? Did you use a marketing app such as Wishpond to run it? Share your opinions in the comment section below! Cara Tarbaj is a content marketer at Wishpond. When she’s not writing, she’s usually browsing Hype Machine for the latest songs. Reach out to her on Twitter @CaraTarbaj.